Each year the state high school wrestling tournament is held at the Tacoma Dome. For many first-time participants, the venue alone can be overwhelming, and for obvious reasons. It is nothing like the traditional high school gymnasiums the wrestlers have grown accustomed to competing in. In addition to its enormous stature, the usually overly excited crowd is always significantly larger than anything they have experienced, greatly adding to the intimidating atmosphere. The building, the location, and the hectic activity which is constantly present on the floor did not faze Nolan Keesee as a freshman. He had wrestled at the Tacoma Dome a number of times before as a member of the Olympia Wrestling Club prior to entering Black Hills High School. The intensified surroundings did little to affect him. That’s not to say he wasn’t shaken. But the real reason wasn’t because of where he was at, but centered on the individual standing directly across from him. “I was definitely more worried about the guy across from me than anything else,” Keesee said about his first time participating at state. A week before, Keesee earned the status of state alternate after competing at the regional tournament. It is a big achievement for anyone, especially a freshman. 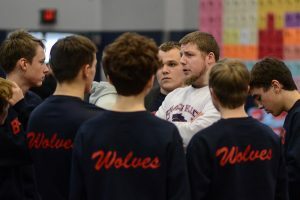 Every weight division in each classification has a set of alternates – a group of individuals ready to step onto the mat should a state participant be unable to complete. Usually, the alternates become spectators. But every now and then, on that rare occasion, an alternate gets the call. This was the case for Keesee. Fast forward three years and Keesee, now a three-time state participant, is no longer the wide-eyed youngster, unsure of whether or not he belongs on the same mat with some of the state’s premiere talent. He’s right there with them. 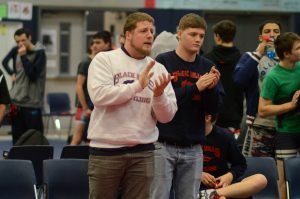 Usually coaching staffs need a few months, if not more, prior to the start of a new season to get everything lined up before their squad even steps foot in the mat room. Pannkuk-ault had a little over two weeks. Pannkuk-ault credits seniors Keesee, Jordan Claridge and Cade Lester and juniors Tate Elliott and Julian Kennedy for making it a near seamless transition despite the whirlwind turnaround. It’s a talented group possessing a lot of state wrestling experience as in addition to Keesee, Claridge, Elliott, and Kennedy were all state participants in 2018. Like Keesee, Claridge and Elliott had similar state experiences last year, both losing their opening round matches and notching a win in the consolation bracket before bowing out in the next round. Claridge, who wrestled in the 182-pound weight division as a junior, is ranked No. 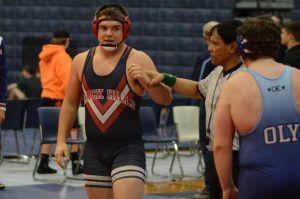 4 in the 2A classification in the 220-pound division this year, while Elliott is the fifth-ranked 285-pound wrestler. 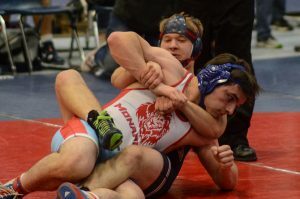 Kennedy, currently ranked fourth in 2A at 170 pounds and a standout Greco-Roman wrestler, is seeking a consecutive state placing, after finishing sixth at 160 last year. Outside of Keesee, all four started for the Wolves’ football team this year, helping Black Hills win the 2A Evergreen Conference and advance to the state quarterfinals for the first time in school history – a pair of accomplishments Lester believes will play large roles in the Wolves’ success on the mat this season.